We stayed at a wonderful little hostel called Empedrado, recommended by Felicity and Aaron (thank you guys! ), which was outstanding! Nice, affordable rooms, huge free breakfast, rooftop terraces, hammocks, lots of common areas to hang out in and free wine every night. It was every bit as wonderful as it sounds. We once again arrived on a holiday – go figure that the long weekend extended to Tuesday – so everything was conveniently closed. Luckily our hostel offered a 12-dollar, all you can eat, all you can drink BBQ that we took full advantage of. A group of twelve of us sat around for hours, chatting about our trips, eating meat until we wanted to throw up, and graciously accepting the never-ending bottles of vino that our host relentlessly brought to the table. Morning number one and I already had a red wine hangover… I see how this is going to go. We made it to our buffet breakfast by 9:15; an excellent time considering we are now accustom to sleeping until 11 every morning. But the victory was short lived when Adam insisted on napping again before the wine tour. Whatever… We’re on vacation! It was a later start than expected, but we rolled up to Mr Hugo’s just before 1pm. For those of you who know Mr. Hugo’s, you probably just thought “Uh Oh…”. 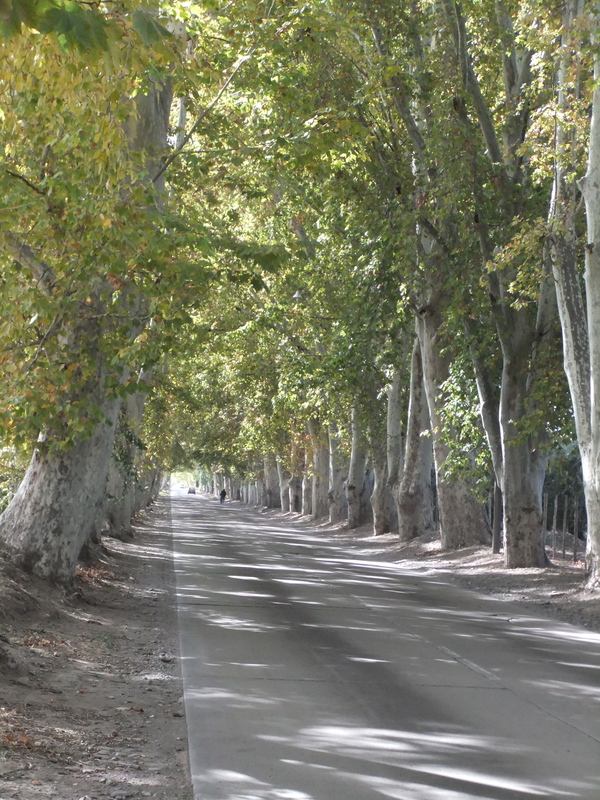 For those of you who don’t know what I’m talking about, Mr. Hugo’s is a well-known tour company for checking out all the wineries in the Mendoza area. You rent bikes from him, he gives you a map, and you leisurely explore the wineries at your own pace. Seems very lovely… Until you experience this yourself. We laughed… Turns out he was right. After getting the low down on the various vineyards, Mr Hugo offered us some free wine. “wine’s always free at Mr. Hugo’s!” he boasted. When we had finished, he filled up our glasses again. Uh oh. After our third refill we quickly jumped up, trying not to be rude, and hopped on our bikes. “Thank you, but we must be going!” We hadn’t eaten in 4 hours, and we were already tipsy from three glasses of wine. Good thing we only had SIX wineries to get through that afternoon. Firstly, I would like to point out that this biking situation would NOT fly in most countries. Not because we didn’t have helmets, not because we drove against oncoming traffic where buses sped by at alarming speeds, but because driving a bike, drunk out of your mind, is considered EQUAL to a DUI in most countries. Argentina has its own rules… And by that, I mean NO rules. 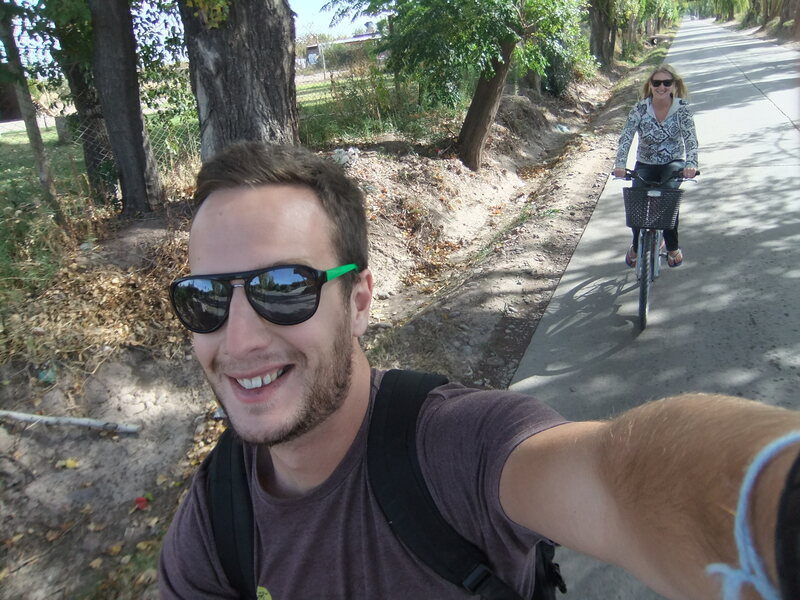 Biking wine tour is totally legit. I also found out, that biking with a little bit of a buzz, and knowing that your final destination is a beautiful and relaxing vineyard, ACTUALLY makes biking a pleasant experience (mostly). I cruised along and, without knowing it, biked a half marathon easily without loathing my existence! Such an improvement! 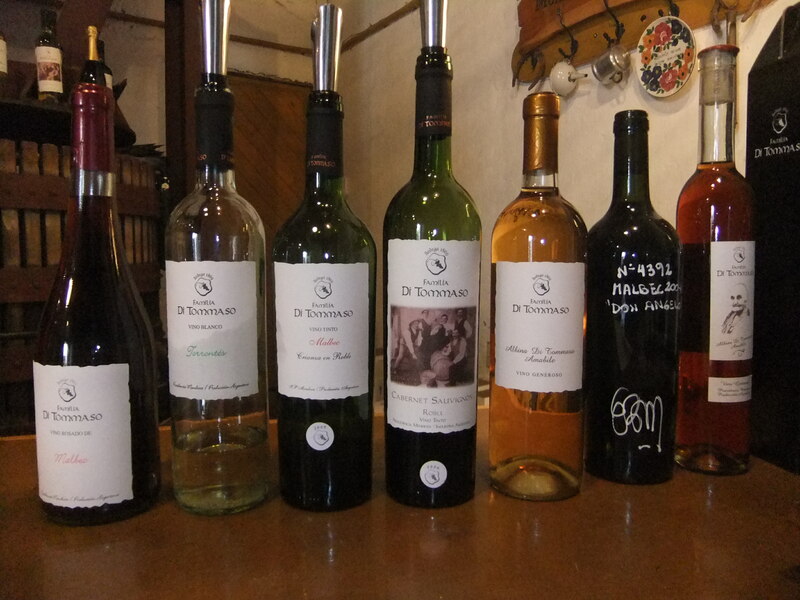 Our first winery was Tomasso: a family owned vineyard that has been open and operating since 1869, making it the oldest bodega in Mendoza! It is beautiful (as most vineyards are) and has a quiet restaurant in a shady area that overlooks the fields of grapes. We had a tasting of 4 of their famous wines and actually learned a lot more about wine than I had expected. The differences between Crianzas and Robles (6 and 12 months in the barrel respectively), the origin of the Malbec grape (apparently Eastern Europe) and some other minor facts I was surprised about! The guide was a wealth of knowledge when it came to wine, and since Adam and I were the only ones there, we peppered him with all our questions in rapid fire! After our tasters we figured we should eat something (see, we were trying to be responsible!) 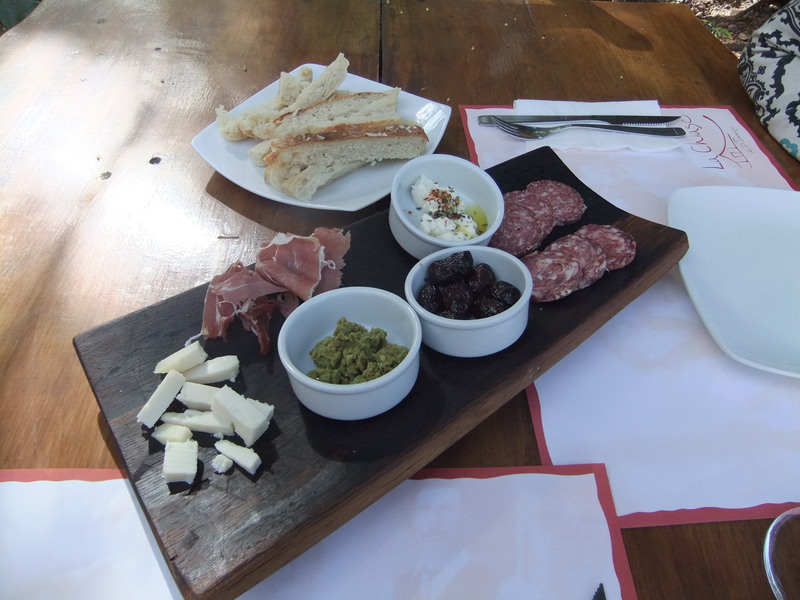 and sat out in the restaurant and ate a small platter of meats, cheeses and olives… With a glass of our favourite wine from the vineyard of course! And then we added our tasters to our rapidly growing wine log so as not to forget. 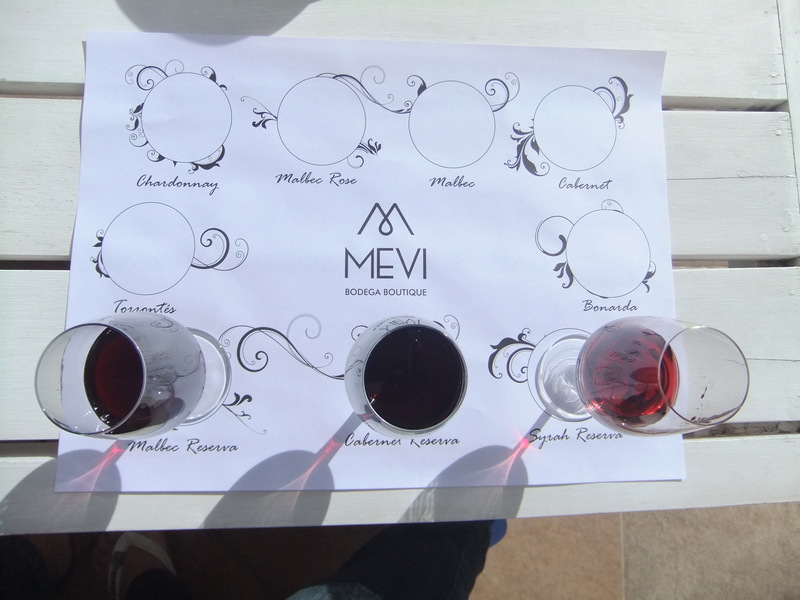 So into Mevi we went, and this vineyard was even more stunning than the last. We were led out back to the upstairs porch that looked out across the winery: an olive tree grove, acres of grapes and the mountains in the background. 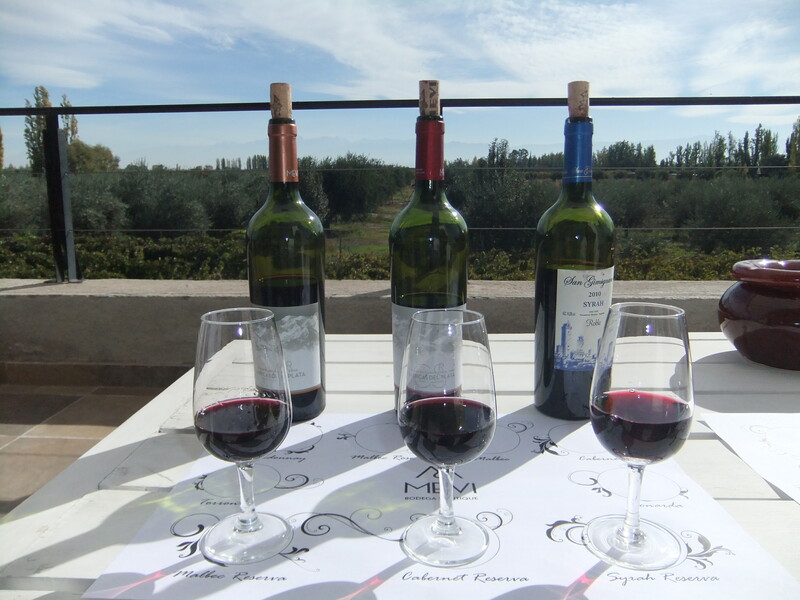 We lounged in the hot sunshine on a comfy white couch and picked our wines. Reservas (aged 15months) were the only way to go. Not only were they so much better than the regular wines, we realized that if you fork out the extra 10 pesos for the better wine, they will give you the cheaper wine tastings for free anyways. Win/win! The view at this winery was by far my favourite, but the lady working there didn’t have a clue about wine. When she tried to convince Adam and I that a Syrah and a Shiraz were not only the same grape (which I agreed with), but also the exact same wine, I lost all faith in any of her future facts. Am I a wine snob? Nevertheless, Mevi’s wine was excellent! 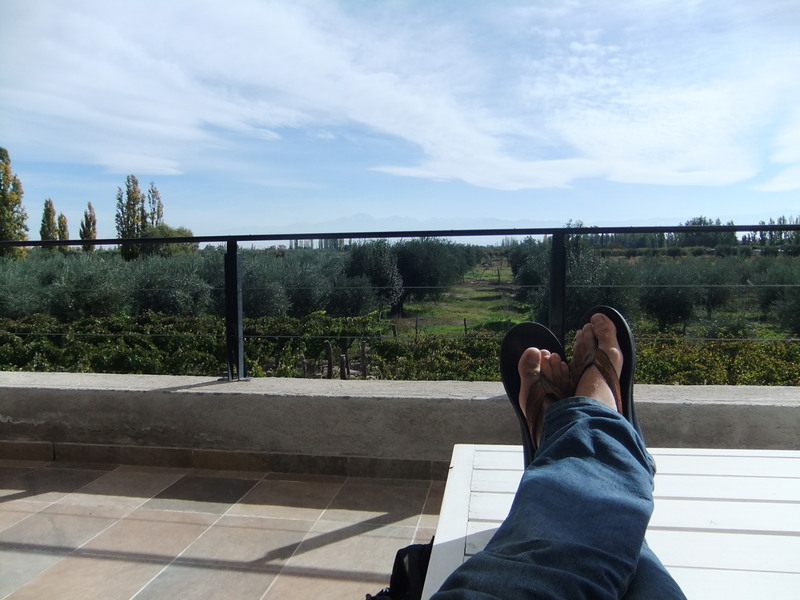 I could have sat there all afternoon if there were no more vineyards to visit that day! A little way into our tour, Frederic, a guy from our hostel that joined us at the BBQ, arrived with a Father/Son duo from Ireland. “When in doubt, a bottle of Vino, right?” Yup… The five of us were going to get along famously. Adam and I drunkenly biked the 500m to the next winery, and minutes later Frederic and the Irish guys joined us. We sat down at a table, together with another couple, and each ordered the 4 wine, half glass tasters that they offered. This was, by far, the most wine I have EVER seen on a table at once. 22 glasses of wine were lined up along the table. All reservas (’cause we’re classy like that) and all delicious! It wasn’t long before the Canadian/ Irish banter came out, and we were good-humoredly picking fights with each other… This continued relentlessly for the next seven and a half hours. Nonetheless, we kept drinking, and was particularly fond of this vineyard’s Syrah (something we haven’t given much thought to here in South America). Before we knew it, it was 5:30, and we remembered that all the vineyards closed at six. Three wineries in, we were in no way prepared to stop now. Our reckless group of five quickly biked the tedious 100m to our last winery: Tempus Alba. Unfortunately for us drunkards, this happened to be the classiest bodega on the tour. At this point, we were borderline disasters… We ordered another tasting set, and sat out on the balcony just in time for the sunset. This winery actually had my favourite of all the wines on the tour! Their 2006 Tempus Pleno was BY far my favourite wine in the past four months (and I’m hoping that wasn’t due to the extreme amounts of booze I had been consuming that day). Even at the winery it was a $45 bottle of wine and all of us were 100% sold on buying a second bottle. Unfortunately (or luckily) the winery had closed, and we were sent back to Mr. Hugo’s. This is where the night went downhill. Mr. Hugo’s was packed! Everyone who had been on a wine tour that day was hanging out at the rental place. There were tables and benches and pitchers of wine set out among the guests… “wine is always free at Mr. Hugo’s!” Oh No!! We sat. And we drank… And we drank until we realized we hadn’t eaten in 8 hours and we’d been drinking for 10. Three or four pitchers of plonk wine later we decided to cram the five of us in a cab and head to a steakhouse in Mendoza…. To be honest, the rest of the night is fuzzy. We ate, ordered more wine, tried to get home, had some altercations with a cab driver and the cops, and hours later… I woke up covered in purple. Solid day. We didn’t do much the following day. Missed breakfast, managed to walk the single block to the supermarket, failed at exchanging money (again) and went back to our room to watch a CSI marathon on TV. 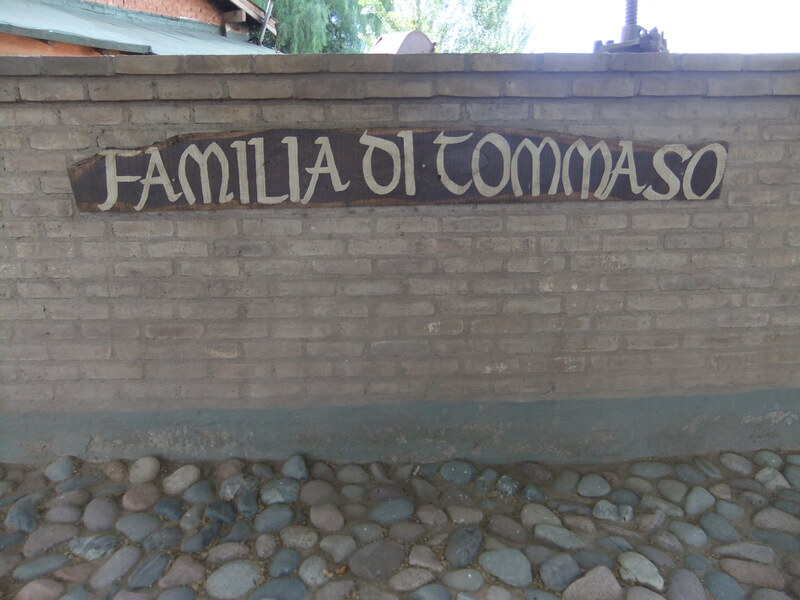 We did make it to a wonderful pasta dinner at Tommaso Trattoria that was fantastic! Another fabulous recommendation from our friends Katelynn and Scott! And then off to bed early. On day three, we hopped on the bus and went BACK to Mr. Hugo’s. I know, we are crazy… But we had missed a winery, and we were determined to take it easy the second time round. We only had TWO glasses of wine at Mr. Hugo’s before setting out, and our first two stops served food instead of wine! We started at a little olive oil factory and got a tour of the olive oil making process. There’s not many things in the world I love more than stuffed olives, tapenades, baguettes dipped in a rich olive oil and balsamic vinegar, and all you can eat food. That is what this place had to offer. There were three tables all set out before the two of us. The first had olive oils, balsamic vinegar, puréed olives, chilies, mustards and a bowl of bread. We shoved our faces full of everything and cleared the basket of bread in record time. The second table was jams. Chutneys, jelly’s, marmalades. Some made with malbec wine, others with whiskey, each of them more unique than the last. These were good, but as soon as our guide turned her back to talk to other people, we were back at the first table, filling ourselves with spicy mustard and garlic tapenade like it was going out of style! The third and final table was liquors. A row of about twenty different ones, Adam and I got to choose four to try. We picked a spicy liquor that had a chokingly strong pepper aftertaste, a smoother Irish cream liqueur, Tia Maria (a rum mixed with coffee and tea) and a 75% Absinthe… Obviously. These were good, but mostly sweet, and after two stops of this we were happy to make it back to a winery. 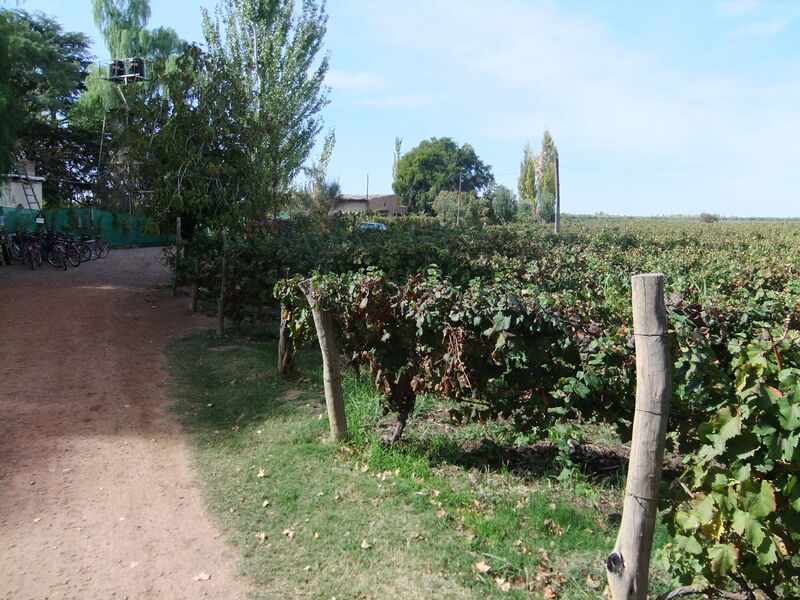 Our third stop of the day was Trapiche: the largest winery in Mendoza. Trapiche vineyard also has the largest amount of exports, shipping their wine to over 70 different countries around the world. Here we tried, not the basic wine, not the Reservas, but instead, we had the luxury of trying the Gran Reserva wines! Aged 18 months in the barrel, gran reserva wines are supposed to be the best of the best… And they are delicious! We even tried a gran reserva Chardonnay, which was unusual and rare considering a huge majority of wines here are red, and to take the time to make a gran reserva white is a risky business. It was not bad for a white, but if I’m going to choose a white wine I’m probably not going to be looking in the Mendoza section of the liquor store. Their 120-anniversary blend was delicious and the Malbec was an obvious favourite for the winery. The tasting room at Trapiche was so beautifully put together. Dark wood bars with leather couches and a dim lighting. The room had a glass floor that looked down onto hundreds of stacked, French-oak barrels below. Glass cabinets lined the walls, displaying their most famous bottles. The place was very luxurious! But after Trapiche we decided we better be responsible and head back into town before we got stuck partying at Mr. Hugo’s again! We found a lovely restaurant near Plaza Independencia and shared a tapas platter over a bottle of Malbec. It was an early night once again, as we had booked our LAST, 16-hour bus ride to Buenos Aires early the next morning. We were so adamant about forgoing an overnight bus, in fact, that we chose the early morning, milk-run day bus that took an extra 2 and a half hours to reach our destination. Although there was no food served, and no exciting landscapes to be seen, I think we made the right decision… Buenos Aires, here we come! 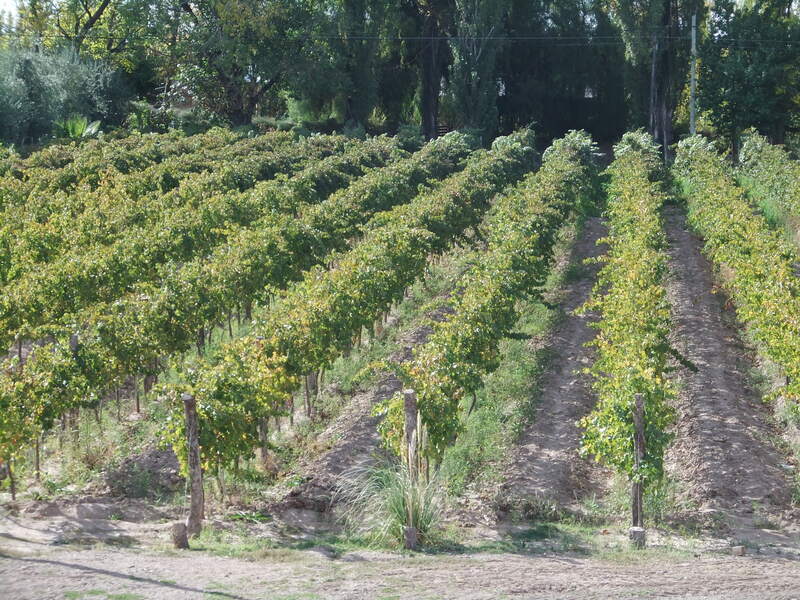 This entry was posted in Argentina, South America and tagged Mendoza, Mr Hugo, Travel, Vineyards, Wine by hilarylust. Bookmark the permalink.